I miss my friend, treasured with affection as she grew old. I only knew her thirteen years before she passed away. What great times we had, as well as the fun of ordinary times, like a simple stroll; or sitting by the grill (charcoal of course), enjoying the moment drinking a beer. Beer was her favorite. She relished beer better than chips, more than cheese, maybe even more than meat, which is saying something if you would see her confronted with the delight of those foods. Maybe she felt as an equal with me when we drank beer together. My friend was a golden retriever, and she received only a sip or two at a time. Her name was Zoi. In the drink named Tamon, I invented a syrup as an ingredient. First came the syrup, then the drink. The syrup is called Zoi’s Mix. 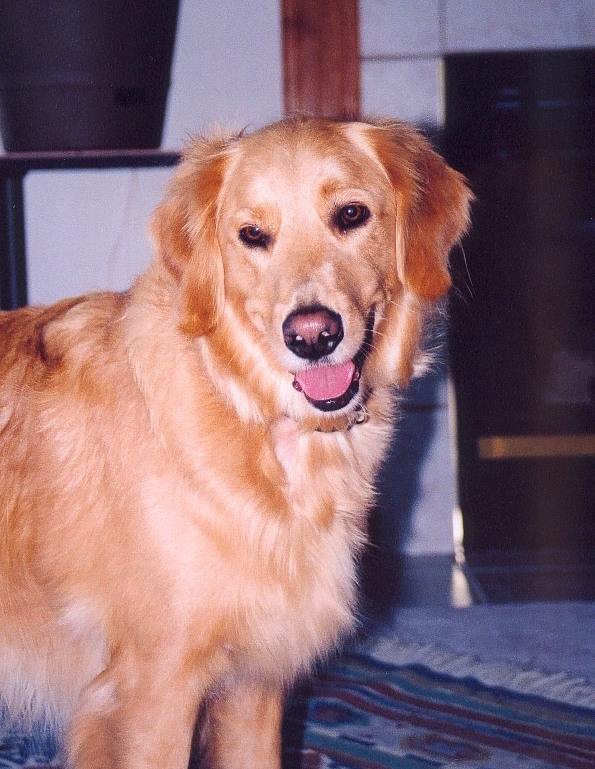 Zoi was a dark golden retriever, not like the light blonde colors. I wanted to match her color by making a dark orange – thereby qualifying the pomegranate & pineapple. The next ingredient needs some explaining. Zoi had stomach problems from time to time, and would stop eating. After veterinary advisement, I fed her cottage cheese and instant rice, merely a teaspoon every hour or so. Once her hunger strengthened, I increased the amounts and intervals between feedings until she could eat a half cup of each. I was delighted to see how much she enjoyed it, and warmed me to see her eat. She had no appetite, yet would scarf down this combination. When she felt better, I discontinued feeding her the rice and cottage cheese, returning her to normal food. Okay, explanation concluded – this ingredient is a symbolic gesture of that rice…now think of horchata, which is made from rice water, as well as adding creaminess to the orange color. The final ingredient is beer. Zoi and I mostly drank lagers or pilsners, typically preferring light beer during hot weather. Zoi, in fact, did prefer light beer, since I let her taste a dark beer once or twice. After she drank it, in the afterward “cleaning her chops” mode, it did not appear she enjoyed it as much a lighter flavored beers. Also, she and I agreed about hops – leave those beers for those of appreciation. They’re not for us. I attempted at Zoi’s coat color. Muddle lemon peel with syrups and bitters. Add rums and juice. Shake. Double-strain into chilled cocktail glass. 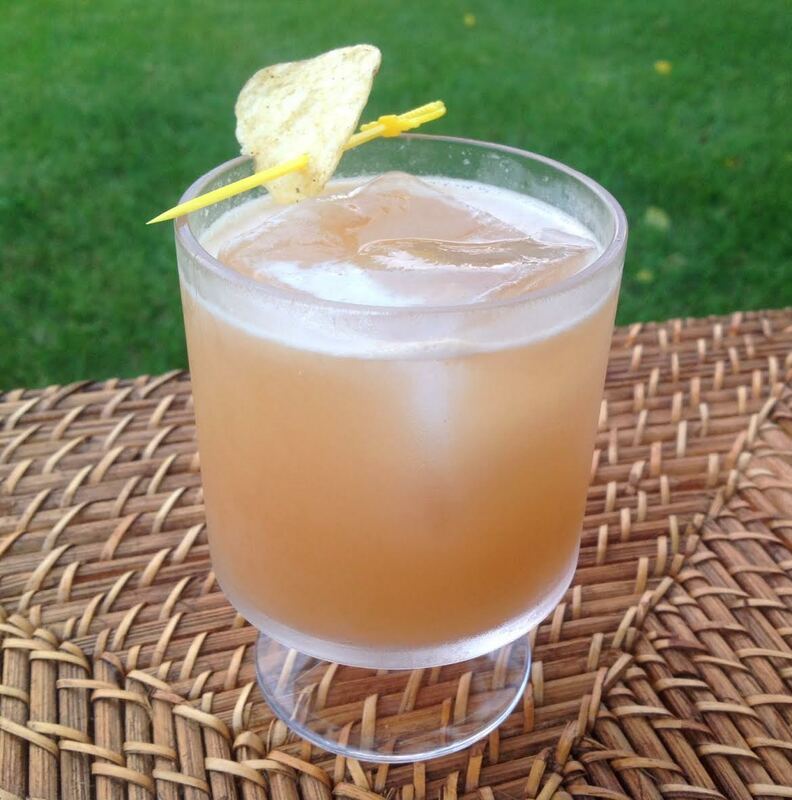 Garnish with a potato chip…because I dedicated this drink to a chip-loving dog. But aren’t they all chip lovers? Pick off the crispy shell, which at times might take more effort, then plop the sticky pod into the rum. Cover securely, and rest out of reach of sunlight, or refrigerate, but remember to agitate each day. We’re not going for big flavor, just glancing flavor, enough to make a point. If you want more flavor, let it steep for a couple weeks. It will definitely taste better. Double-strain, and then again through a coffee filter. Add all the ingredients in a small such pan – do not boil, but stir regularly for a few minutes, lower heat to low for a couple more minutes. Then let cool to room temperature. Double-strain, then again through a coffee filter. For more flavor, let this sit overnight (covered in the refrigerator), or better yet, for two days. But not any longer than that without a cap of vodka for preserving. If making pomegranate juice, lightly muddle pomegranate seed pods, but do not crush the seeds, then muddle with pineapple chunks. If using Pama liqueur, you don’t get any muddling fun. Add beer and horchata. Simmer on medium heat – do not boil – stirring regularly. Reduce by half, which should take some time. No worries – drink a beer! Take off heat, strain, pressing out solids if you muddled pomegranate. Add a cap of vodka. Keep refrigerated, as it will last at least 2 weeks. Note: Please understand the mix will taste a bit sweeter if using Pama. Zoi’s Mix is a syrup…if using another syrup in your drink recipe, compensate by adding less of the other sweetener. Please enjoy this drink with a friend. Maybe imagine Zoi staring at you, alternating with your friend’s attention in hopes of affecting you with her deeply imploring eyes for you to give her some beer.